‘We Three Kings of Orient Are’ is a popular Christmas carol written and set to music by Rev. John Henry Hopkins Jnr in 1857. This is about the wise men mentioned in the Bible who came to Bethlehem with the gifts of gold, frankincense and myrrh to pay homage to the newborn infant Jesus. Oral tradition gradually transformed the wise men of the east into three kings from the Orient. Western Christian tradition regards the three Kings as Melchior – a king from Persia,Balthasarr– a king from Arabia, and Gaspar – a king from India. ‘We Three Kings’ is one of my favourite Christmas carols.The “three kings” referred to in the carol keep ringing in my ears and provides the inspiration for this post-Christmas ‘Spotlight’ column. 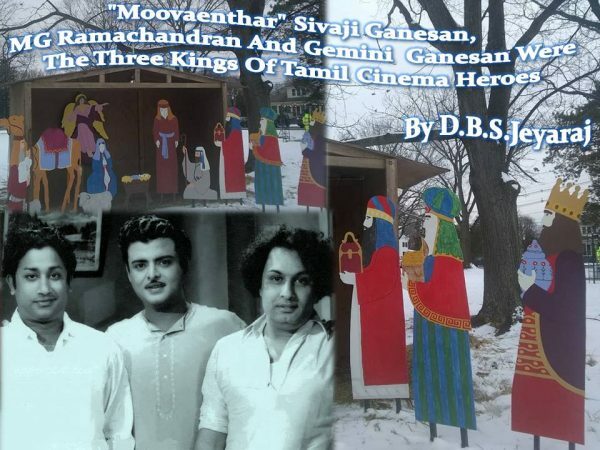 Only this article will be about three cinematic kings and not the mystical kings of the orient.This latter-day trio of kings were actor-heroes who reigned supreme as monarchs of Tamil movies during the latter half of the 20th century. Sivaji Ganesan, M.G. 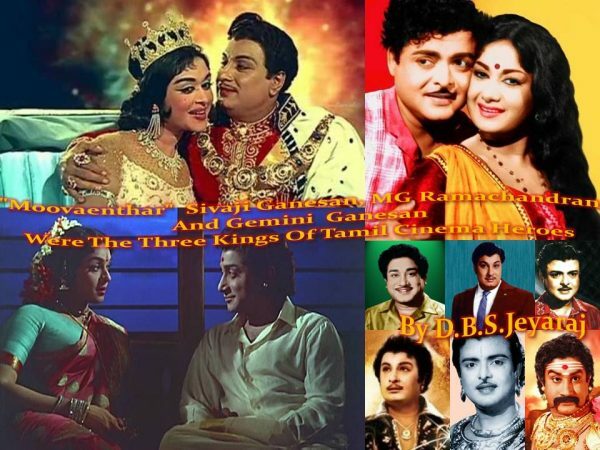 Ramachandran (MGR) and Gemini Ganesan comprised the triumvirate that dominated Tamil movies from the fifties to the seventies of the 20th century.The top thespian trinity of that vintage in Tamil cinema were Sivaji, MGR and Gemini. They ruled the roost in ‘Kollywood’ as the Tamil Nadu film industry is referred to in lighter vein. The three kings of Tamil cinema were contemporaries who acted mainly in separate films. There were however a few exceptions.GeminiGanesan acted in several blockbusters alongwith Sivaji Ganesan. Notable among these were ‘PenninPerumai,’ ‘VeeraPandiyaKattabhomman,’ ‘KappalottiyaThamilan,’ ‘PathiBhakthi,’ ‘Pavamannippu,’ ‘ParthalPasiTheerum,’ ‘KandanKarunai,’ ‘SaraswathieSabatham’ and ‘UnakkahaNaan’. Gemini’s only film with MGR was ‘Muharaasi’(1966) where he played MGR’s elder brother. Sivaji Ganesan and MG Ramachandran have acted in only one film,‘Koondukkili,’ made in 1954. They played two friends in that milestone movie. Though Sivaji,MGR and Gemini were hailed as the ‘Moovaenthar’ (Three Kings) of Tamil cinema, it was widely acknowledged that Sivaji Ganesan was the finest actor among the three. He was called “NadigarThilagham,”meaning ‘Doyen of Actors’. Vizhuppuram Chinniah Ganesan, or V.C. Ganesan, was born on 1 October 1928, in Vizhuppuram, which was then in the Arcot District of the former Madras Presidency. His parents were Chinnaiapillai Mandrayer, a railway employee and freedom fighter, and Rajamani. Young Ganesan became enamoured of acting and abandoned school when he was in Class Two. Forsaking home, he along with his boyhood chum “Kaka” Radhakrishnan (veteran comedian who passed away in 2012) joined the Madurai-based Bala Gana Sabha drama troupe first, and later the troupe run by Ethaartham Ponnusamipillai. From child roles he graduated to female roles and then on to the “Raja part,” the role of the hero, as it was known then. The first landmark in his career was his portrayal of the Maratha warrior-king Sivaji in the drama ‘Sivaji Kanda Indhu Rajyam’ written by Dravida Kazhagham and later DravidaMunnetra Kazhagham Leader C.N. Annadurai, who went on to become the Chief minister of Tamil Nadu. “periyaar”(Great person) E.V. Ramaswamy, the patriarch of the Dravidian movement, acclaimed his stellar performance and referred to Ganesan as ‘Sivaji’ Ganesan. This was in 1946. The sobriquet has stuck ever since. Sivaji Ganesan’s acting career, which began at the age of eight, could be divided into three phases – 1936 to 1952, when he acted only on stage; 1952 to 1974, when he acted for the big screen and also gave stage performances; and 1974 to 1999, when he acted only in films. Despite achieving stupendous success on the screen, Sivaji remained faithful to his first love, the stage, and acted in plays for decades. With more than 300 film roles to his credit, Sivaji inspired a whole generation of artistes, virtually creating a new school of acting. Essentially a creature of the stage when he entered films, Sivaji Ganesan brought that baggage with him and superimposed it effectively on the film medium. Yet his brilliant acting made this so-called violation of screen norms the accepted norm of film acting. Generations of Tamils learnt to appreciate the beauty and power of the Tamil language because Sivaji Ganesan breathed new life into it. The big break in Sivaji’s career came in 1952, when he acted as the hero in ‘Parasakthi,’ a film directed by Krishnan-Panju. The dialogue, written by DMK Leader and former Chief Minister M. Karunanidhi in fiery and flowery prose with a surfeit of alliterations, the hallmark of Karunanidhi’s style, came powerfully alive in a stunning performance by Sivaji, unparalleled in Tamil cinema. The monologue uttered as an address to Tamil Nadu in the earlier scenes and the courthouse speech in the closing stages of the film were classic instances of delightful oratory. A star had arrived in Tamil cinema! Sivaji Ganesan spoke Tamil on screen the way the mellifluous, vibrant language should be spoken. Sivaji had an extraordinary flair for dialogue delivery. He pioneered an exquisite style, diction, tone and tenor. Scriptwriters were to provide dialogue that tapped his diction, which rendered the Tamil language euphonious. There were many notable films where his remarkably resonating dialogue delivery delighted and enthralled fans. Moreover in song sequences Sivaji had an astounding capacity to synchronise lip and body movements to playback renditions making it appear as if he was actually rendering these songs. Ironically, the man hailed as the greatest actor of Tamil cinema never won an Indian national award for best actor. He was conferred the Dadasaheb Phalke lifetime achievement award for meritorious service to Indian cinema in 1997. Sivaji Ganesan passed away at a Chennai hospital on 21 July 2011. Although the brightest star in the Tamil film firmament is no more, Sivaji Ganesan’s films are there to provide pleasure to his fans and keep his memory alive. MGR, whose full name was Marudur Gopalamenon Ramachandran,was born in Sri Lanka! Though MGR was an actor of Malayalee ethnicity who made a name for himself in Tamil Nadu, he was born in Hantane, Kandy. His father, a native of present day Kerala state in India, was at that time teaching in an estate school in Kandy. MGR, the youngest child, was born at home in Hantane on 17 January 1917. He was given the name Ramachander at birth. M.G. Ramachandergrew up in Kandy till he was two. In 1919 the family returned to India afterGopalamenon fell ill. The familytook up residence in a place called Othappaalam where Gopalamenon started tutoring children from rich families. Tragedy struck in 1920 as Gopalamenon passed away due to illness when young MGR was only three and his elder brother Chakrapani nine. The mother Sathyabhama then relocated to Kumbakonam where her brother Narayanan’s family was residing. Sathyabhama called Sathya struggled to bring up her two sons. She worked as a domestic servant doing cleaning in Brahmin homes. After a while brother Narayanan suggested that Chakrapani should give up school and find work because of the family’s precarious financial state.Narayanan himself was attached to the drama troupe ‘Madurai Original Boys Company’. The troupe specialised in staging plays with young boys as actors. Uncle Narayanan found a place for the nephew at the drama company as an actor. A few years later Ramachander also followed his elder brother’s footsteps and joined the Boys Company. Both brothers toured many places as drama actors. Meanwhile the cinema industry began taking root in India. The silent movies gave way to talkies and filmmaking became a craze. Many film companies hired stage actors to act on screen also. Young Ramachander got his first chance in films when the film ‘SathiLeelavathy’ was made in 1936.MGR got a break playing a detective role. He was only 19 at the time. MGR’s career as a film actor proceeded in fits and starts. Though he had the necessary looks, physique and martial skills required by an actor, MGR had to be initially content with minor roles only. MGR acted in only 20 films during the 1936 to 1947 years. His name was displayed as M.G. Ramachander in the titles then. M.G. Ramachandran was picked by Jupiter films to play the hero in the film ‘Rajakumari’ (Princess). MGR now began getting more lead roles. In most films he played an action hero. Soon he became a popular actor whose films were box office hits. The magic initials “MGR” began garnering an incredible number of fans. MGR himself underwent two transformations as his acting career blossomed. Firstly he changed his name to Ramachandran from Ramachander. Nevertheless it was as MGR that he was widely known. Secondly he joined the ranks of the newly-formed DravidaMunnetra Kazhagham (DMK) led by C.N. Annadurai known as “Anna” or elder brother. MGR acted in 116 films during the period from 1947 to 1978. He gave up acting in 1977 after he became Tamil Nadu Chief Minister. His last film ‘ MaduraiyaiMeettaSundarapaandiy an’ (Madurai Liberator Sundarapaandiyan) was released in 1978. Twelve of MGR’s films were silver jubilee hits running for over 25 weeks each. Another 68 films ran for more than 100 at theatres during their first screenings. Even the MGR films that did not run for a 100 days initially turned out to be money-spinners in the long run as each re-release brought large audiences to theatres. MGR had a formula of his own in the films he acted in. The story had to be sentimental with displays of mother-son love or brother-sister affection. Despite ups and downs and twists and turns, the good guy had to triumph in the end. Needless to say MGR was always the good guy except for a few roles in the early stages of his career. The films had to have a positive message imparting a lesson to the people. The hero was regularly portrayed as a paragon of virtue who fights for justice on the side of the oppressed. The hero sings philosophical songs. Besides these features, a typical MGR film always had thrilling fight scenes and titillating love song sequences. MGR got the finest villain actors to play opposite him. Likewise MGR always had the loveliest actresses as his scintillating heroines on screen. Of these stars, MGR has acted in the most number of films with Jayalalithaa Jayaram as leading lady. It was well-known that MGR was infatuated with the alluring actress with whom he paired in 28 films. Though they never married, Jayalalithaa was regarded as the love of MGR’s life. Next to Jayalalithaa,MGR has acted in the most number of films with B.Sarojadevi. In his screen roles, MGR always fought for the underdog against tyranny and injustice. He took special care to project a social message in most songs, and took care to act in different roles so that different segments of the population could relate to and identify with him. A unique feature of the relationship between the movie stars of the Indian south and their fans was the proliferation of fan clubs. M.G. Ramachandran encouraged the phenomenon of fan clubs from late 1940s onwards, and the clubs ended up as a well-knit federation that counted its membership in the millions. The clubs held annual conventions and also participated in social service projects. When MGR entered active politics, his fan clubs were in turn politicised and soon became an indispensable component of the partypropaganda machine. In MGR’s case both spheres mutually reinforced each other — film popularity providing political mileage and political positions strengthening film popularity. MGR formed the Anna-DravidaMunnetra Kazhagham (ADMK) after splitting from the DMK in 1972. He later amended it to All-India Anna DravidaMunnetra Kazhagham (AIADMK). MGR’s new party romped home as winners in the1977 polls. MGR became Chief Minister of Tamil Nadu. His followers who dubbed him earlier as “PuratchiNadigar” or ‘Revolutionary Actor’ now hailed him as “PuratchyThalaiver” (Revolutionary Leader). MGR was elected Chief Minister again in 1980 and 1985 after his party won at the polls. He died in harness as Chief Minister on 24 December 1987.The then Prime Minister Rajiv Gandhi bestowed upon him posthumously the “Bharat Ratna” which is the highest civilian honour in India. Gemini Ganesan was regarded widely as the greatest romantic lover in Tamil cinema. In fact he was dubbed “KaadhalMannan,” meaning ‘King of Romantic Love’.In a career spanning more than five decades Gemini Ganesan made his mark in Tamil films as the romantic hero par excellence. Though he played a number of diverse roles he made his mark as a lover on screen. It was this which earned him the laurel “KaadhalMannan”. “Gemini” Ganesan was born on 17 November 1920 into a well-educated middle class Brahmin family in Puthukoattai which was then a principality ruled by a king or “Rajah”.His father was Ramaswami and mother Gengamma. His given name at birth was Ganapathi SubramaniaSarma but was generally called Ganesan. Soon he became known as Ramaswami Ganesan or R. Ganesh. In some of the earlier films in which Ramaswami Ganesan acted, the credits show him only as R.G. As his screen career blossomed, the actor became known as “Gemini” Ganesan.The prefix “Gemini” came into being because prior to acting Ganesan had worked as casting director at the prestigious Gemini studios in Tamil Nadu. Gemini however was the odd man out among the top three. Unlike MGR and Sivaji, he had no professional experience as a stage actor. Both MGR and Sivaji had learnt the ropes as part of the Madurai Boys Company drama group. Though he lacked stage experience like Sivaji and MGR, unlike them Gemini had tertiary qualifications. He was a BSc graduate from Madras University whereas the others, having taken to the stage in childhood, learnt from the school of life. While MGR’s on screen hallmark was swashbuckling action sequences and Sivaji that of powerful dialogue delivery, Gemini cooed and wooed his way into many a heart. All the world loves a lover! Gemini was the greatest lover on Tamil silver screen, making hearts flutter. His handsome features, dashing personality, cavalier attitude, soft speech, twinkling eyes and impish humour proved an irresistible combination. Girls blushed as Gemini’s soulful eyes from the screen seemed to penetrate the innermost depths of their hearts.Though he proved his mettle in many movies with fight scenes and heavy duty dialogue, Gemini was not classed as a fighter or actor in the MGR-Sivaji mould. This softie image led to a nickname “Sambar” or vegetable broth. Gemini’s first film role was in ‘Miss Malini,’ a film based on a short story by R.K. Narayan. His turning point was as the hero playing dual roles in ‘ManampolMankalyam’ in 1952.From then onwards there was no looking back. He has acted in more than 200 films in Tamil, Telugu, Malayalam, Kannada and Hindi. Most films however were in Tamil his mother tongue. Twenty-eight of his Tamil films ran for more than 100 days. Three of them celebrated silver jubilees with each running more than 25 weeks. Gemini was essentially a director’s actor. Unlike some other top actors of the time, Gemini never imposed himself on the director. He was prepared to play any role and willing to be guided by the director when filming. Gemini believed that the director was the captain and adhered to their directives obediently. Some of his roles are unforgettable. Many of the films in which Gemini acted were ‘triangular’ love stories. In most instances Gemini would play the man torn between two women. He played those parts with great sensitivity. His magnum opus however was in his own production, ‘NaanAvanillai’ (I am not he), directed by K. Balachandar. Gemini played seven different roles. The story was about a bigamist posing off as different men in different disguises to different women. It was a case of art imitating life and Gemini was in his element playing all roles. It was a sign of Gemini’s remarkable sense of humour that he chose to film such a story as the only film he has ever produced. Unfortunately it did not click at the box office. The MGR-Sivaji-Gemini period at its best was the golden age of Tamil cinema. Gemini Ganesan, the last of that trio, breathed his last in 2005. The one-time heartthrob of Tamil cinema passed away peacefully in his sleep on 22 March at his residence in Nungambakkam, Chennai. Ex-actress Jayalalitha Jayaram who has acted opposite Gemini in some films was the Tamil Nadu State’s Chief Minister then. Jayalalithaa remarked then that the death of Gemini Ganesan was “an end of an era in Tamil cinema”. Many actors have romanced their heroines on screen in the past and no doubt will do so in the future. The “Romantic King” crown of Tamil cinema however belonged to Gemini Ganesan and all other aspirants to it are only pretenders to the throne. He was and will be forever the “KaadhalMannan” of Tamil cinema just as MGR was the “PuratchiNadigar” (Revolutionary Actor) and Sivaji its “NadigarThilakam” (Doyen of Actors).